My beautiful friend and hair stylist, Alayna, helped switch my hair color up over the weekend. It's not a drastic change, but I really like it. You see, I have a tendency to get bored rather easily when it comes to the color of my hair. For the majority of my life, I went for the bleached-out blonde look. It was like an obsession as to how blonde I could be. Everytime I went back to the salon, I would say, "Can you make me blonder?".... "How about blonder!" as the bleach and dollar signs washed down the drain. So, my quarter-century hair crisis soon turned into a quarter-century identity crisis. After a month of not recognizing myself, I knew I had to get back to my roots. But what where they? I found out, with a few highlights, my natural hair color wasn't so dish-watery, or "poop-color" as I used to call it, and, not only did I embrace it, I actually loved it. But, like I said...I still get bored. But not as easily. The days of bleached out hair, and trying to drastically change who I was, by changing my hair color are behind me. But, I'm never afraid of a little change. Don't be afraid to experiment and try something different or new. But remember, you are most beautiful just the way you are. Gorgeous! I never know what to do with my hair. I can relate with getting stuck in the blonde craze & constantly wanting it blonder. I have taken my hair a lot closer to my natural color (very close to yours), but am really wanting to take the plunge & take out almost all of the blonde. Lol this outfit is very festive ! Your wearing Xmas :) love it!!! !love ur hair !!! You're gorgeous in all of them! you just described my entire relationship with my hair... to a T.
I actually died mine the same dark red colour for a brief time. It looks amazing for the first few weeks and then slowly starts to fade... You look gorgeous no matter what though. I like the dark color but your hair is gorgeous no matter what. i actually think you look incredible with dark hair, but i also love what you've got going on circa right now too! p.s. 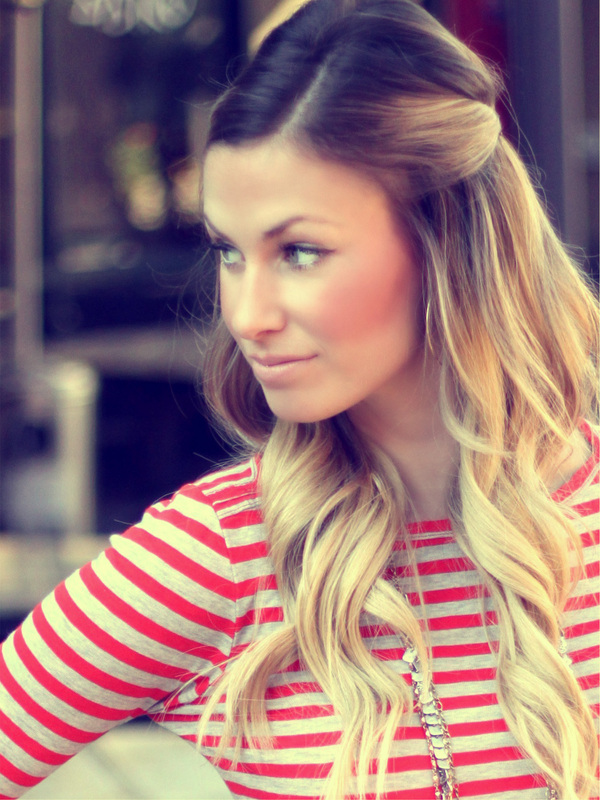 i JUST ordered a red and white stripe shirt frlom stylemint...i swear it's a dead ringer for your j.crew top! Absolutely love your hair color. That;s so brave of you to try all of those colors. I want to make a change to my hair but I'm so scared that I'll hate it. omg, I can totally relate to this post and I LOOOOVE the last 2 hair color pics the best on you! I decided I wanted to be blonde last month. Dear friend and stylist said no, which I'm thankful for. So we went for a partial ombre in the front. It was different but not too drastic, so I'm pleased. great post! i think you look amazing in all those hair colors, wow! love your new hair now too! Congrats on your blog, I really love it! With http://vivaluxury.blogspot.com/ It's my favorite. Gorgeous girl! Blonde is super pretty on you! You're so lucky to be able to change hair color! I have SUPER dark brown/black hair and adding any color would be so awkward. I think all the colors looked great on you, and I think this hair rendition is by far the most beautiful! First off, you look GREAT! Second, I've totally done this, too! Went blonder and blonder and blonder until my hairdresser told me if I went any blonder my hair would fall out from the root! I am in love withhhh the blond!! You look like a blond bombshell! You look gorgeous in the dark brown and medium brown aswell! Im pretty sure its those killer eyes that im so jealous of missy! i love it! i've never dyed my hair but last week i chopped it all off. and then proceeded to cry for 2 hours. Love all your hair color adventures!!! I love the way you've got your hair now, but fyi, you look fabulous in everyone of those pictures even your olivia wilde dark hair. It looks lovely! Very striking, but I do LOVE LOVE LOVE the way you have it now! Your hair looks very healthy! With experiencing different hair colors, have you ever experienced breakage? If so, what helped you get your hair back to being more healthy? You can def. pull off all of the colors! The new color looks great as well! Omg! Love all your hair colors. so does this make you my oliva wilde if i'm trying to go for your hair color (well, the bottom right one anyway)? Well one thing is sure, you are beautiful no matter what hair color you have! Love the new blonde not so blonde look! I too went through that "make me as bleach blonde as possible" phase. I recently went dark again, my natural color is a medium brown and I dye it black... its crazy how much of a woman's identity gets created in our hair, but its true, it adds a little flavor and spice to our style and helps shape us. I personally love the last two pictures of your hair transformations... and for the record, I think that the dark WAS striking... you give Olivia a run for her money! i love it so pretty and feminine. i could never dye my hair...but you look beautiful my love. I love your outfit! the red and white stripes with blue? Genius! You look gorgeous with all of your different hair colors. Not everyone can pull off different colors, but you do it amazingly. Such a fabuloous post (and topic!) I think too many of us over-think our hair. You look beautiful with all the varying colors, however you look gorgeous with what you currently have. It just looks effortless and natural...and probably is lower maintenance as well! I love your hair the color it is now. Its very natural blonde and I like that :) and by the way I tried doing my hair like you have it above with the sides pulled back, major fail! I am so not good at doing my hair. my fave has to be picture the last two pictures in the box...you are no less gorgeous in any of these photos really! All these colors are gorgeous but I have to say i love the bottom two pictures the most! 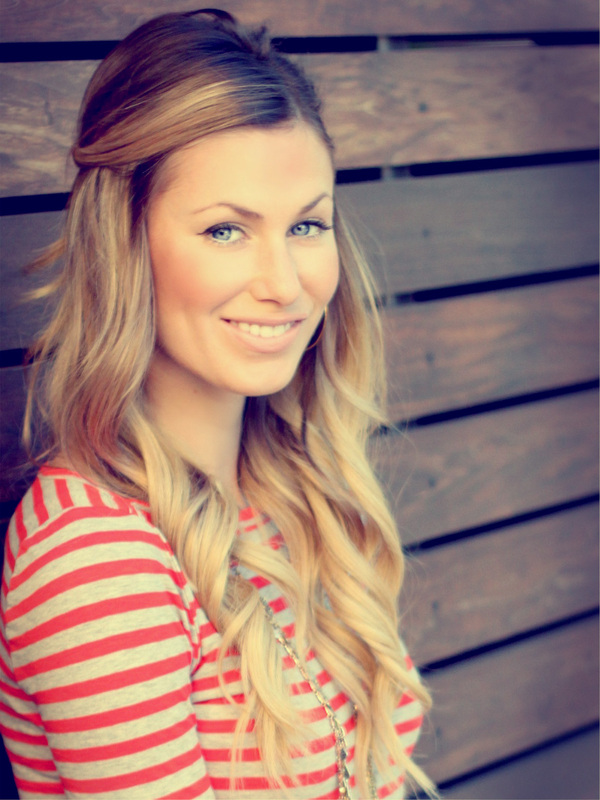 Beautiful hair color=)You are a pretty girl=),Im a new follower.Check out my blog.. The first photo is absolutely STUNNING. YOU are absolutely GORGEOUS!! You are one of those people who can wear ombre and look stunning. I LOVE the ombre on you, it's really beautiful. What you are describing is exactly me! Actually this post came at a great time. I was super blonde and kept going blonder and blonder but didn't really like it so when my roots started coming through I thought I would go super dark, almost the same colour as your Olivia picture. For 2 weeks I didn't recognize myself! I'm finally getting used to it but now I just want to go to my natural colour, maybe with a few highlights and STAY there. Problem is I get bored easily... One question how hard was it to go from your Olivia colour to your more natural colour? What was the process? I've had a full head of natural hair for a whole year now, after consistently dying it shades of plum/caramel/raspberry (you name it) from the age of 16! And I don't think it's ever looked better! Can I just say that you look uncannily like Jordan (do you have her in the States? aka Katie Price?) in that pic with the dark hair?? I love your hair! I am thinking of going dark soon (bored again! ), but you have inspired me to get some extensions as well! Love your blog! Wow, I'm so glad I found this. I'm also 26, with what I think might be naturally "poop" colored hair, but I've gradually overdone it on highlights and want to go more natural. 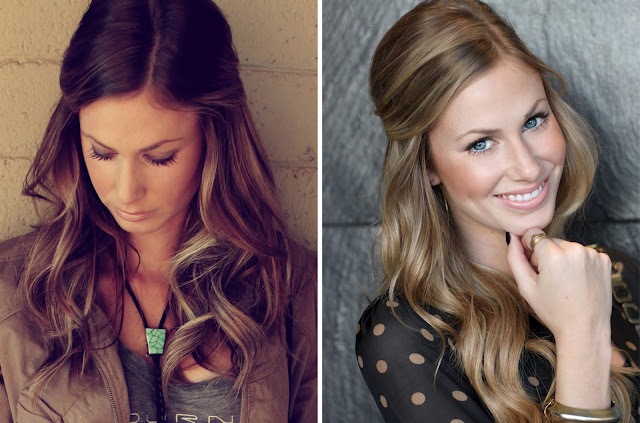 Can you tell a little about how you transitioned back to your natural color? I'm debating if I should just let the blond grow out, or if I should get lowlights. You tried out a lot of hair colors! Luckily they all look good on you! I'm so afraid of dying my hair. I'm so indecisive I'm afraid I'll hate it if I ever dye my hair. My sister dyes her hair. She's actually done what you've done over the years..trying on different looks. Now she sticks with blonde. Maybe you're inspiring me to try it out.. I'm a new follower of your blog and I'm loving all of your fun posts! This one in particular is a favorite of mine, mostly because I can identify with your story in so many ways (I too tried to dark hair look after so many years of blonde, and in the end, found myself going with something more natural). You seriously can ROCK any hair color, but I have to say that my favorite is the picture in the bottom right corner. So natural and beautiful! You look like Gisele!!! SO pretty! I think you DEFINITELY pulled off the olivia wilde look! however, i can understand how you felt weird because the way I see it, blond is a lifestyle. Especially here in CT where there are so few! 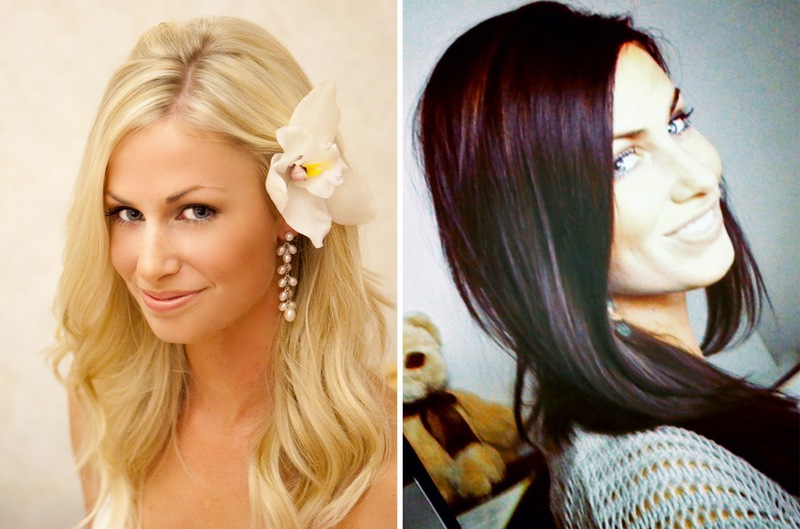 I'm critical with the blond-to-brunette transformation too.. I was just thinking to myself that I wouldn't recommend it for anyone unless it was a mistake or something! You've just changed my mind about combat boots and the latter. PS, the new ombre is my favorite! I love the dark brown colourm it really suits you. Love ur hair. Mine is about as long as your but ithas no style to it. If i went to a salon how would i explain a cut like yours? I love the bottom two colors the most! My original hair color is what my stylist likes to call "ashy" and "something you don't want back" after highlighting and dying my hair blonde for several year I decided to try dark also...it didn't turn out so well. I felt like a vampire with my fair skin and blue eyes. Now I'm somewhere in between bleach blonde and brown but I'm itching to make a change! I like your blonde hair the best. I like your last post about the clip in extensions too! I bought some awhile ago and I have been starting to wear them more often. Plus I love your red stripes and colored jeans. It is a great everyday outfit. You can find so much more style and outfit inspiration at this everything fashion and beauty community called Socialbliss. Here's a link to my collections www.socialbliss.com/jenna-beal Thanks! It is amazing how much hair coloring can really change someone's look. All of your different hair colors are inspiring to me! I have always wanted to go to a salon and have them change my hair color, but I've always been too scared. I think I'm going to the change that, though! Next week, I'm going to change my hair! !